New Knesset Caucus for Olim from France discusses urgent need to remove obstacles to aliyah from France. 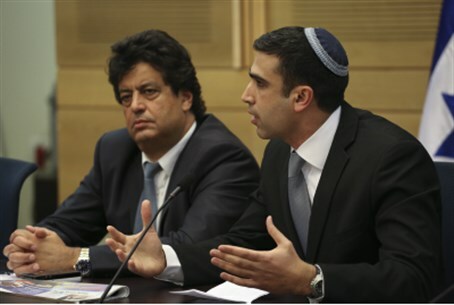 The Knesset Caucus for Olim from France and Francophones in Israel was inaugurated Wednesday in the Knesset. The caucus is an initiative of MK Yoni Chetboun (Bayit Yehudi), who will head it. About 100 of the leaders of the organizations of immigrants from France attended the event, as did Absorption Minister Sofa Landver, Immigration Ministry Director Oded Forer, Jewish Agency Director Josh Schwartz, World Zionist Federation Chairman Avraham Duvdevani, French MP Meir Haviv, Deputy Defense Minister Danny Danon (Likud Beytenu) and MKs Nissan Slomiansky, Shuli Moallem and Orit Struk of Bayit Yehudi, Karine Elharar and Rabbi Dov Lipman of Yesh Atid, and the Head of the Etzion Bloc Regional Council, Davidi Perl. Chetboun said that at present, mistaken policies are blocking the potential stream of olim from France. “You can't expect aliyah and prevent it at the same time,” he added. Director Forer said that while 60% of French Jews are considering emigrating, half of those prefer not to go to Israel. One of the major obstacles to aliyah is the difficulty in getting diplomas and degrees recognized, mostly in medical professions. MP Haviv also urged that French diplomas be recognized. “France is not a third world country,” he said. “You want to encourage aliyah, and it is important to remove this unreasonable obstacle of non-recognition of diplomas. The waves of anti-Semitism in France are getting stronger and aliyah is necessary.” Haviv, who is considered close to Prime Minister Binyamin Netanyahu, said that Netanyahu promised him he would soon join the effort to ease aliyah from France. About 200,000 olim from France and French speaking countries, recent and veteran, live in Israel. In 2013 alone, 3,120 Jews made aliyah – a 63% rise from 2012. Unlike previous years – more olim came from France than from the US, and the trend is expected to gain strength.